Students who wish to receive an AMS Early Childhood Credential upon successful completion of all course requirements, must pay a registration fee to AMS to become a member of the organization. This ensures that AMS opens a teacher education file for each student. With their membership, each student receives the AMS magazine, Montessori Life, and reduced fees for AMS conferences. (AMS fee is $310) *$40 fee will be charged for NSF cheques and declined credit cards. LMS Montessori Teacher Education Program is registered as a private career college under the Private Career Colleges Act, 2005 and approved as a vocational program under the Private Career Colleges Act, 2005, offering the Montessori Early Childhood Course (for teaching 2 1/2 to 6 year old children). 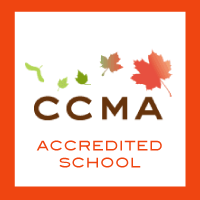 The program is affiliated by American Montessori Society, and fully accredited by MACTE (Montessori Accreditation Council for Teacher Education). The components of this course include Independent Study, Academic Phase, Practicum Phase and Final Evaluation. The Independent Study is comprised of reading and research on Montessori Principles and the Philosophy, followed by preparation of essays, Assigned Observations in Montessori Schools, with written reports are also include in this section. The Academic Phase ( 312 total hours scheduled classes for lectures and material demonstrations, plus 22 hours for observations) includes lectures on Principles and Philosophy, Child Development, Classroom Management, demonstrations of Montessori materials and preparation of material albums. The Practicum Phase (540 hours of paid or volunteer internship in a Montessori school) is a practice teaching experience which includes observations, assignments and evaluations by the supervising teacher and the Practicum supervisor. The Final Evaluation includes Oral and Written examinations and presentation of Year’s Research Project and Material albums. Applicants must have a College diploma or University degree. Applicants with an Ontario Secondary School diploma, some post secondary education and relevant experience will also be considered. Applicants must be at least 20 years old. Preference will be given to those who have completed a University degree in a related field such as education, sociology or psychology. The need for Montessori teachers continues to grow, all over the world, and notification of teaching opportunities worldwide will be provided for all of our students. Classes will commence June 26, 2019 with two and a half weeks of classes and will continue one weekend per month throughout the school year. Review classes are scheduled in July, 2020, culminating in final exams in July 2020. All phases of work for the course must be completed before final examinations. The Practicum portion of the course may be undertaken at any Montessori school and arrangements for practicum are the responsibility of the adult learner. Assistance will be given in making contact to arrange the practicum placement. *Additional questions? Please contact Janice Mayhew at jmayhew@lakeviewmontessori.ca. All applicants must complete the enclosed application and return it with a deposit cheque of $500 Canadian and 3 post-dated cheques. Please include a current resume stating all education and experience, along with two character references (at least one should be from someone who has seen you working with or caring for children). Once applicants have been accepted to the course, they must arrange for official University or College transcripts to be sent directly to Lakeview Montessori Teacher Education Program at Lakeview Montessori School. A police clearance is also required for each student. The cost of the course is $5,500 and will be paid as follows: A $500 Canadian deposit must be handed in with the course registration form. The post-dated cheque schedule is as follows: the first term payment of $2000 is to be dated for June 26, 2019; the second term payment of $2000 must be dated October 1, 2019 and a third term payment of $1000 is to be dated February 1, 2020. NOTE: Practicum Supervision outside the city of Windsor will be subject to an additional mileage fee for visits. *$40 fee will be charged for NSF cheques and declined credit cards.